It's hard to believe that we've been hard at school for 6 weeks! I am always so amazed at how seamlessly things fall into place when school begins. Our teachers work hard to prepare lessons that are engaging for our students, are deep in rigor and prepare them for the work force we can yet but imagine! 1. Technology integration in the curriculum- enhancing the curriculum with tools that our 21st century learners use daily, collaborating on a global scale with the use of technology, connecting to real world experts, virtual field trips and more! The possibilities are endless. 2. Social emotional learning- learning more about executive functioning skills and those that are necessary for success. Exploring topics such as grit, growth mindset, character and how to teach our children self-efficacy. 3. 21st century best practices for teachers- As we learn more and more about how our children learn best, we become better at our craft. Just like in other professions, teachers love learning from other teachers. This group will explore a wide variety of strategies and best practices for teaching and learning. Look for whole brain teaching, interactive word walls and much more! This is an exciting time to be a student! With the help of technology, a global community is virtually at our fingertips. Students are able to even perform science experiments digitally. A big focus this year for our students will be on goal setting. Students in grades 2-5 will be writing personal goals throughout the year. Younger students will be discussing goal setting in class, in guidance and we encourage you to do the same at home. We look forward to seeing each of you at Parent/Teacher conferences next week. This is an important time to connect with your child's teacher about what's going on in the classroom. Please be sure to contact your teacher if you've not yet signed up. October is full of exciting events for our school community! 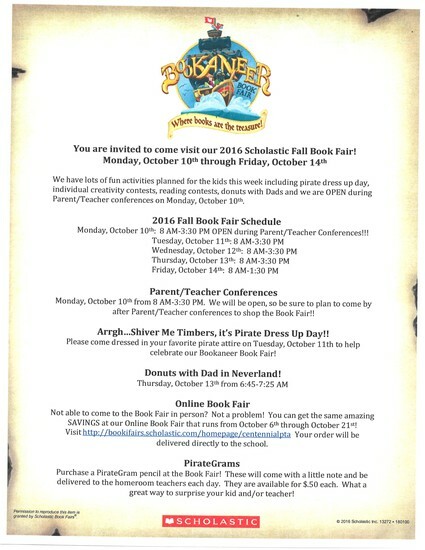 We hope you can join us for the book fair, the Fall Picnic and Color Run. 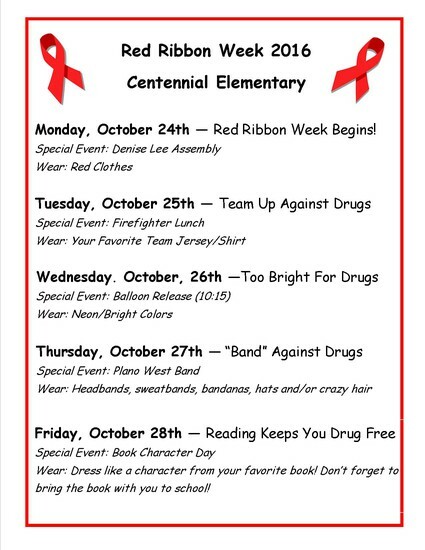 Our students will enjoy a fun filled Red Ribbon week, provided by our generous PTA, with a message of resilience, positive personal choices and remaining drug free. Last month we collected hats in support of Childhood Cancer Awareness month. We are overwhelmed by the generosity and support of our extended Centennial families and proud to announce that as a school community we collected 120 brand new hats to be donated to local area Children's hospitals and 14 gently used hats that will be donated to Good Will. This month Student Leadership is participating in the "Project Hygiene" Drive. We are collecting personal hygiene products that will later be bagged to make personal hygiene kits. The kits will be distributed to students in Plano that are in need. The last day to donate items is October 14th. Thank you for helping make our drive a success! Centennial is as strong as our parent and community support! I challenge our parents, if you haven't already, to visit CentennialPTA.net and join the PTA. Thank you to the 220 Centennial families who already have joined the PTA this school year - we would welcome *all* our families to be a part! Our Centennial teachers and staff have already reached the goal of 100% PTA membership! 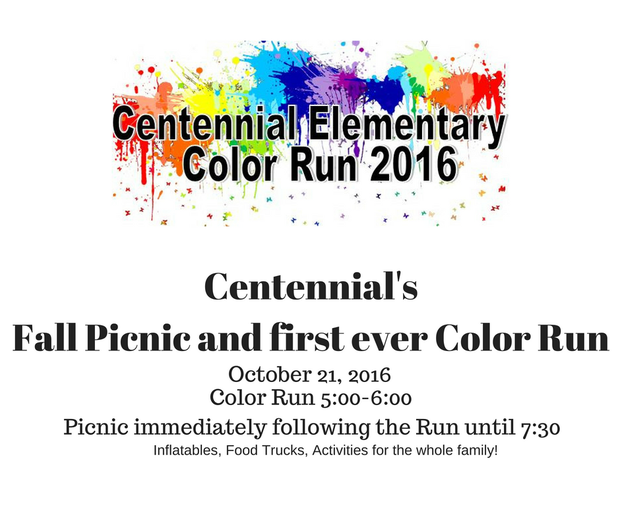 A quick reminder, students wishing to participate in the PTA Reflections program must have a parent member of the Centennial PTA. 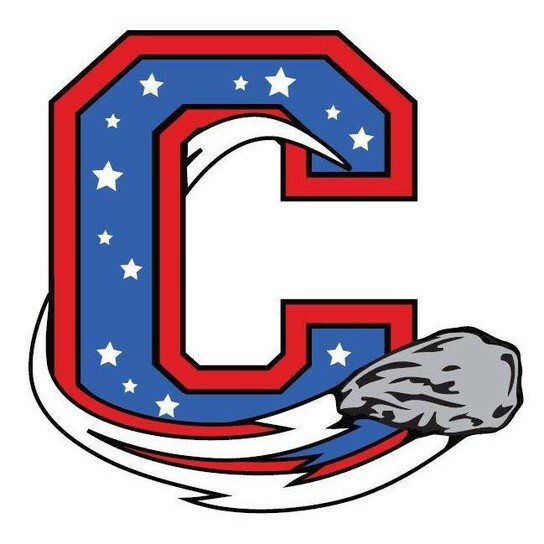 Thank you Comets! Centennial Elementary is lucky to have award winning author, Tammi Sauer, on November 16. She will be speaking to kindergarten through second grade. Fourth grade will have a very special presentation on writing. PTA will be sending out order forms closer to the date. Each October we celebrate Red Ribbon Week, the oldest and largest drug prevention campaign in the country! Each day of the week will have a different theme to honor our pledge to stay drug and alcohol free. Students are encouraged to participate in these themed days! In addition to our school programs, we encourage you to take some time during the week to talk to your student about the importance of staying drug and alcohol free! Below is the calendar of events and theme days for Red Ribbon Week 2016! Thank you so much for your cooperation during carpool! We've streamlined some procedures and seen a huge improvement in arrival and dismissal. Your child's safety is our number #1 priority, thank you in advance for your cooperation. We are looking for some D.I.Y.ers to help with stage props for our Spirit Assemblies! If you are good with woodworking tools and/or are crafty, please contact Jennifer Collins at Jennifer.collins@pisd.edu OR Julie Morano at Julie.Morano@pisd.edu. Ready Rosie is an online tool that provides a daily two minute video modeling everyday interactions or activities that students and parents can do together. These activities are for families with children from birth through 3rd grade. Sign-up here. Great things happen within the walls of our school each and everyday. 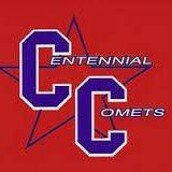 Follow Centennial Elementary on Facebook to see what's going on in our classrooms. In order for your child to be photographed and included on this page, permission will need to be given on the “PUBLICITY & STUDENT RELEASE INFORMATION form” – Signature authorization for this form is located on the Plano ISD Emergency Information/Authorization Form provided from schools and via parent portal.